It's July! Time for sunny days, sultry nights, much-needed vacations, and wonderful books to carry us through the dog days of summer. We're dialing it back a bit this month here at the Dish. We'll be taking some vacation time to recharge our batteries but no worries. We'll be back to full speed in August! We kicked things off on Friday, July 1 with a Q&A with RITA® finalist Marnee Blake. I highly recommend her books, ALTERED and AVENGED! We're on vacation Wednesday, July 13 - Wednesday, July 20. Janga's On Second Thought column will return on Monday, August 15! 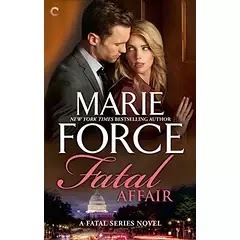 On Thursday, July 21 we're hosting the Marie Force Fatal Affair excerpt tour. The first book in Force's Fatal series, Fatal Affair is being reissued with a brand new cover and for two weeks you can download Fatal Affair in e-book format for FREE. Another fabulous month ahead thank you. Have a nice time off! Enjoy your time off!! Relax and enjoy some summertime reading. Have a great vacation and a well deserved break.